The times they are a-changin’. And so is our PRM, formerly known as CRM. First off we have upgraded its name to ‘Personal Relationships Manager’ because we believe so strongly in the power of relationships. Building brand trust will remain a twinkle in our collective eyes without the relationship building necessary to make it happen. And our PRM is a good place to start. Where will we see these changes? Where won’t we see changes? You’ll still be able to access your PRM via the navigation bar on the left, and every functionality that was previously there, will still be there. However, it will all look a lot less early 2000s, and will be much, much faster. All contacts will still be divided into multiple contact lists. However, you’ll now also be able to look through all contacts, by clicking on the ‘all contacts’ button on the top of the page. 1. Lists are now fully searchable, not just by name, or email address, but you can also search based on city, country, tags, organization, phone number, etc. 3. As you can see, this filter makes a segmentation of my most active and engaged journalists, by selecting only my contacts that open at least 70% of my emails, and click through in more than 40% of my emails. Very useful for statements or releases that aren’t for everyone. 4. Bulk deleting and bulk tagging. You can now easily select a group of contacts and move them to trash all at once. For instance, if you go ahead and check out the contacts you’ve sent more than 10 emails to, you can see those which have never been opened once. This might be an interesting group to reconsider sending emails to. You can now simply create a filter, select all of the contacts, and bulk delete, or bulk tag them with a tag like ‘inactive’. These can then later be kept out of some distributions, or can be contacted via phone to see if they’re still interested, or still use the email address you have on record. 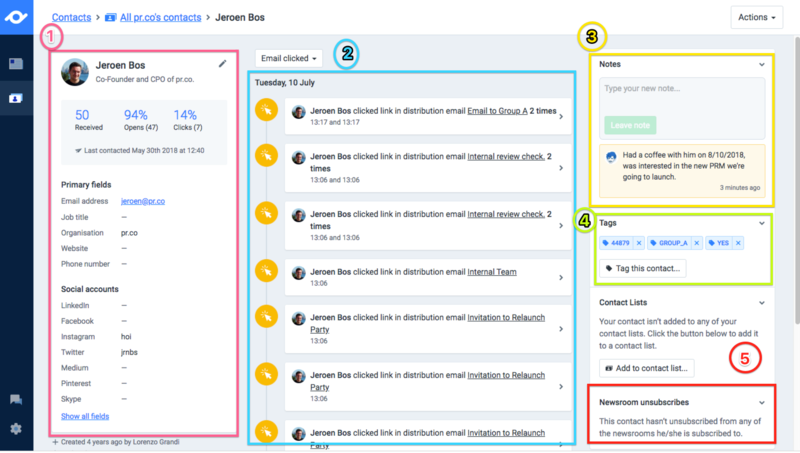 When you click on one of the contacts - simply by clicking on the email address, or name, it will bring you to an overview we’re pretty proud of: the contact overview page. 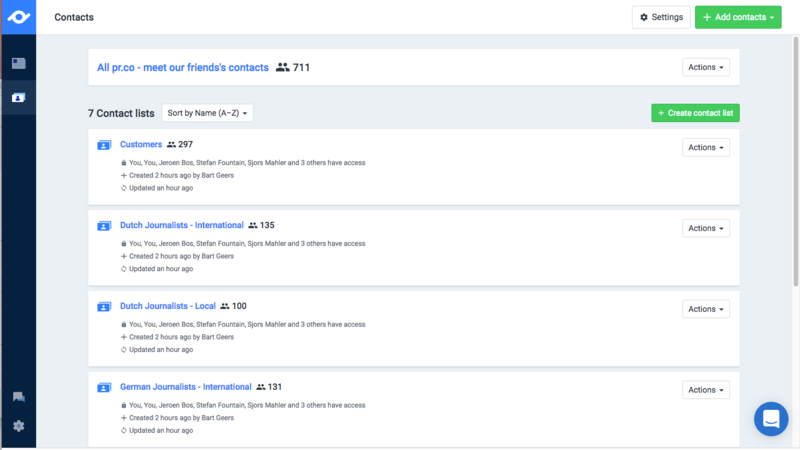 You’ll find a lot of new functionalities here; where you previously only had a few fields when you click on a contacts name, you’ll now see a full overview of that contact, including (custom) fields, a timeline, notes, tags, contact list overview, and unsubscribe overview. 1. (Custom) fields: All fields that were previously in the PRM, will be in the new PRM as well. However, we’ve added a functionality where you can add any field to that PRM that’s relevant to you for segmentation. We still need to build the user interface for that (will be launched within a few weeks), but should you want to add a new field to the PRM, just let us know via the live chat, and we’ll add it to your account. Alternatively you can add a custom field to your organisation when you do a contact import. 2. Timeline: In the middle of the page you’ll find an overview of all the emails that you’ve sent to that contact with pr.co, and how that contact has engaged with those emails. You’ll notice that all information on open rates, and click rates is nicely displayed in chronological order in the timeline. Just want to know when a person has opened your campaign that was sent in May? Click on opens, navigate to May, and you’ll say exactly, if, when and how often your contact has opened the campaign. 3. Notes: We’ve gotten a lot of feature requests for note-taking. You can now leave notes on a contact within the platform on the top right side. Just type a note for yourself, or for your colleagues, hit enter, and the note will appear including the date that it was added, and by whom it was added. Met that journalist from road.cc at a conference? Add it as a note for future reference! 5. Unsubscribes: Not sure if a contact unsubscribed? Or would you like to know when he unsubscribed? Unsubscribe information will be nicely stored for each contact in the bottom right corner. The old importer was a bit of a pain in the behind. Importing has been made easier than ever: simply click on import, drag and drop a .csv or .excel file in pr.co and map the fields in the excel file to match the fields in your PRM. Are there fields in your Excel that aren’t in your PRM, simply add a new field. Once ready, click import, and all contacts should be uploaded in no time. Do I need to do something to use the new PRM? No. All of the contacts that were in the old PRM have already been migrated to the new system, without any data getting lost. Should you run into any problems 🛑 , bugs 🐛 , feature requests 🤔 or have any questions 🤷‍♂️🤷‍♀️ , please don’t hesitate to reach out to the pr.co support team. You can reach us either via the live chat or at hello@pr.co.